(Anaheim, Calif.) –With just one month and two events remaining before the Senior World Championship Team is selected, the Absolute Fencing Gear FIE Grand Prix Anaheim has the potential to have a large impact on who will earn the fourth and final spot. 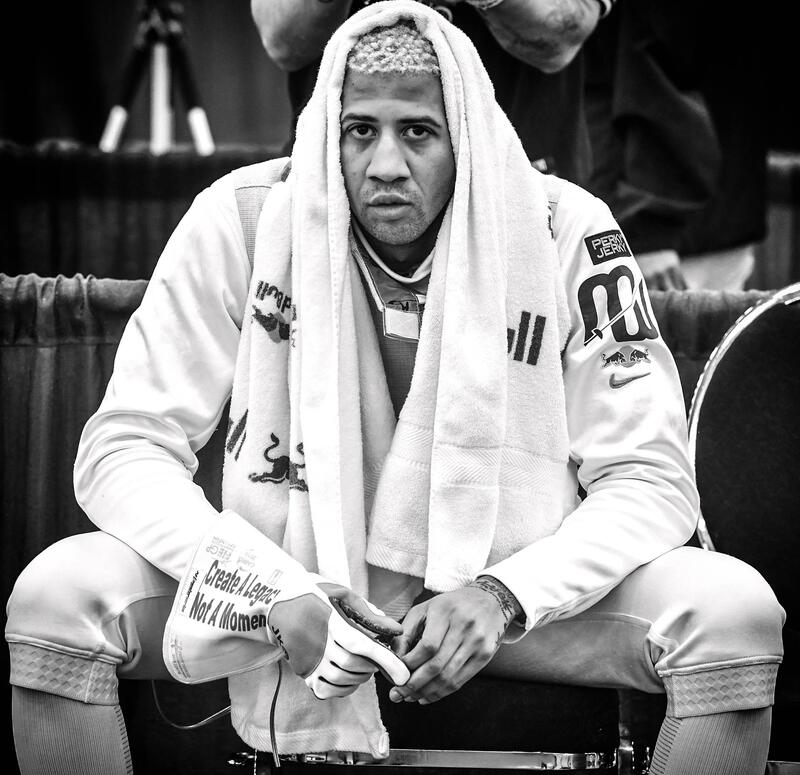 Miles Chamley-Watson (New York, N.Y.), the 2013 World Champion who is looking for a spot on his 10th straight Senior World Championship Team, currently trails 2018 Junior World Champion Nick Itkin (Los Angles, Calif.) by fewer than 1,000 points in the USA Fencing National Team Point Standings. On the first day of competition in Anaheim, it was the veteran, Chamley-Watson, who advanced to Day 2 while Itkin was eliminated, giving Chamley-Watson the opportunity to move up to fourth if he can earn a top-eight finish or better on Sunday with only the Division I National Championships in April remaining before the team is selected. Chamley-Watson advanced to Sunday straight out of pools after going 5-0. Fencing less than an hour from his hometown of Los Angeles, Itkin, who is looking for a spot on his first Senior World Team, went 4-2 in pools and after cruising through his first bout, struggled in his second. Down 10-5 to Chun Yin Ryan Choi (HKG), Itkin closed the gap to 10-7 at the first break and evened the score at 12. However, he came up short on the final touch, losing 15-14. That opens the door for Chamley-Watson, who will face Yudai Nagano (JPN) in the table of 64 on Sunday. With a victory, Chamley-Watson will likely have a showdown with No. 3 Andrea Cassara (ITA), which would be the third of the year. Chamley-Watson claimed victories in both those bouts at the Tokyo and Cairo World Cups. Chamley-Watson was one of four members of Team USA who advanced from the preliminary rounds, making a total of seven U.S. fencers in the table of 64 on Sunday. Marcello Olivares (Cooper City, Fla.) also advanced straight from pools while Geoffrey Tourette (Cupertino, Calif.) and Philip Shin (New York, N.Y.) won their direct elimination bouts to reach the 64. They join Rio Olympic team bronze medalists Race Imboden (Brooklyn, N.Y.), Gerek Meinhardt (San Francisco, Calif.) and Alex Massialas (San Francisco, Calif.), who were exempt from the preliminary rounds with top 16 world rankings. The reigning Cadet World silver medalist, Olivares tied for first out of pools after going 6-0. His closest bout was 5-3 and he earned two shutouts in a pool that included 2016 European Championship bronze medalist Andre Sanita (GER), two-time Asian Championship medalist Young Ki Son (KOR) and two-time Pan American Championship medalist Daniel Gomez (MEX). Fencing in his home state, this will mark Tourette’s first table of 64 appearance this season. The two-time Junior World team medalist went 5-1 in pools to earn a bye to the preliminary table of 64, where he controlled his bout against three-time Asian Championship medalist Youngho Kwon (KOR), 15-8. Shin went 3-2 in pools before defeating Moritz Lechner (AUT), 15-10, in the preliminary table of 128. In the next round, he outtouched teammate Brian Kaneshige (Hoboken, N.J.), 15-14. With a day before the table of 64, Shin will take advantage of a home Grand Prix. Competition will continue on Saturday with the women's preliminary rounds. In both the men's and women's events, the top 64 will fence for a chance at gold on Sunday.